We flew Singapore Airlines from OR Tambo International Airport to Singapore Changi Airport. Our flight was quite turbulent and trying to sleep on a 10 hour journey was next to impossible. I watched as many of the Oscar nominated movies as I could fit into 10 hours and perhaps drifted in and out of naps whilst being rudely awakened by the bumps. With my South African passport, I filled in an immigration form on entry, (important to have the name and address of where you’ll be staying whilst in Singapore), a couple of biometrics authentications later and I was in the clear. What hit me first, as I stepped out of the airport was the heat. It was pretty darn hot, considering I had left a chilly Johannesburg. We had booked a shuttle to take us from the airport to our hotel so there was no need for taxis and trains and trying to figure out transport. I suggest this, if it is your first time travelling to a new country. Then again you might be more adventurous and enjoy the uncertainty of not knowing how you will get to your hotel. Our hotel was standard and although not much to write home about, the roof top pool definitely earned my seal of approval. The hotel is located on Orchard Road, which is a famous retail and entertainment strip. With plenty of malls, bars, restaurants, and other forms of entertainment, it was the ideal place to lay our heads. If you are not on a tight budget, the shopaholic in you will flourish at the high end boutiques littered along this street, from Louis Vuitton, to Dior and Gucci, you can have your pick. For the rest of us, there’s Zara, or perhaps Cotton On and Factorie, and if that’ s still not to your liking, read on ;). We opted to be mostly cashless and used our cards for purchases. Th Singaporean Dollar is at least 10 times stronger that the South African rand. Depending on your bank, take note of your currency conversion rates, administration and card fees. Do some research on cash passports or using a foreign currency and make a decision that best suits your pocket. Credit and debits cards work perfectly here. It is however smart to have cash on hand if you plan on going to the markets or other informal trading areas. Nothing could have prepared me for the transport infrastructure. Having only traveled through parts of Africa in the past, my point of reference for efficient transport was the Gautrain in Gauteng, South Africa. Singapore pulled the rug from under my feet to demonstrate how it could be done. Armed with a map and a 3 day Mass Rapid Transit (MRT) pass for the train, we were sorted. The 3 day pass cost S$30 of which S$10 was refundable. We could travel anywhere around the city, safely and speedily. If you can communicate in English, then you have no worries. If your English needs some work, then polish up on the basics that can help to get you around. I sensed a large western influence, particularly in the dress code. I, for some reason thought people would be more conservatively dressed (excuse the ignorance) but they were more liberal. I noticed a greater variety in culture, in food, which was a mixture of various Asian cuisine. The people were extremely friendly and willing to help. They sometimes offered to help, especially when they saw us reading the map and turning it over several times. I was quite grateful for their helpful nature. Humanity is not all lost. The city is safe and clean. You can walk around freely even after sunset and you are not likely to see litter. After a dip in the pool and a casual stroll around our neighbourhood, we started our exploration of the city with retail therapy, well an attempted retail therapy. Singapore has a particular consumer culture that you can not ignore. Retail stores are abundant. After getting lost a couple of times, we found the IMM Fashion Outlet , a high end discount mall, that promises price cuts on popular fashion brands. Head on over there if that’s your sort of thing. In the evening we visited the worlds highest open air bar, 1-Altitude for sun-downers. This rooftop bar is on the 63rd floor of Raffles Place. Undoubtedly the best view of the city. You get a 360 degree view of Singapore in all its glory. Have a delicious cocktail and indulge your eyes. There is a cover charge, so be sure to check the cost before hand. On day 2 we headed downtown to the Bugis Street Market for some bargains. Bugis street is an informal trading area so carry some money with you. Wear comfortable shoes because it is a big space and you’ll do lots of walking. Feel free to bargain here, hard and shamelessly. You will find anything from clothing, to accessories or little souvenirs to take back home. Also grab a fresh juice for just S$1 and sample the street food. We took the MRT to China Town to visit the oldest Hindu temple in Singapore, the Sri Mariamman Temple . If you’ll interested in exploring some of the culture of the city, this iconic place of worship is worth a visit. Make sure you’re dressed appropriately (not showing too much skin) when you visit. You will also be required to take off your shoes before you enter. You can watch the religious rituals being performed or walk around and marvel at the architecture. What ever you do, be kind and leave a donation for the temple. The China Town precinct is awash with stalls upon stalls, selling trinkets, accessories and of course food. Grab a bite at one of the many stalls here and taste some of the local cuisine. From Chilli Crab, to Char Kway Teow and Nasi Biryani. 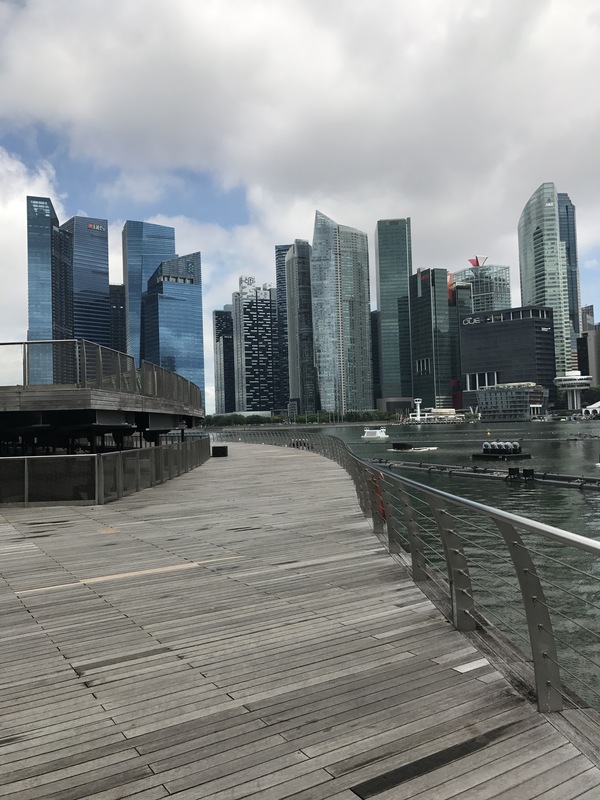 On our morning of departure, we visited Marina Bay to appreciate the the view of Marina Bay Sands, one of the most recognisable buildings in Singapore and where I imagine the crème de la crème lay there heads to rest when holidaying. The views of the the city from the pier are breathtaking. The looming skyscrapers and placid water set the perfect scene for a casual stroll. To end off our trip, we had lunch at the Lau Pa Sat Festival Market if you’re a foodie and a sucker for markets like I am, you’ll enjoy this. From the variety of food options on offer to the grand design of the building, what’s there not to love. And there you have it, we ate, shopped, danced, feasted our eyes and petted the Asian tiger without being mauled.